The Fotodiox Filter Kit contains the three must-have filters that every photographer needs. The kits come with a UV filter, a Circular Polarizer, and a Soft Diffuser. Fotodiox UV Filters help with clarity in sunny or hazy conditions. Fotodiox UV filters are Super Multi-Coated to minimize reflection and reduce flares and ghosting. 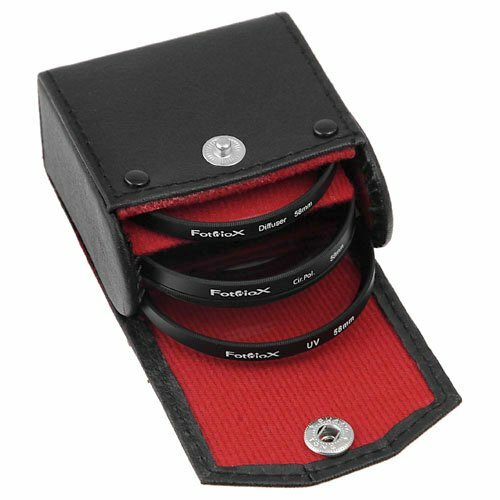 Fotodiox Circular Polarizers work well to remove unwanted reflections from non-metallic surfaces. Fotodiox Circular Polarizers can be used to increase color saturation and provide better contrast. The Fotodiox Soft Diffuser filter is useful for softening landscapes and skin texture in portraits.